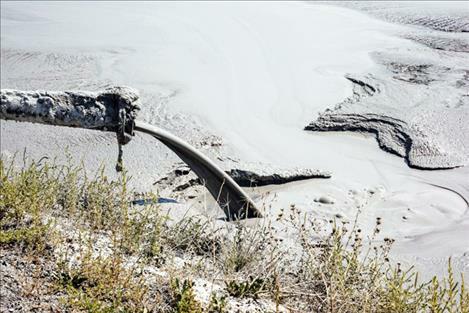 A pipe pours coal ash into a pond at Montana’s Colstrip power generating facility. HELENA — More details have surfaced about new legislation that would allow NorthWestern Energy to buy a bigger share of the Colstrip plant for a bargain. Senate Bill 278 would allow an electric utility to purchase more generation capacity in a Montana coal-fired plant for no more than one dollar, but there’s a catch. The bill would also allow the utility to pass its environmental cleanup and decommissioning costs on to consumers, even if the plant closes early, and without regulatory oversight. Environmental groups have called the legislation a “blank check” from ratepayers to monopoly utilities like NorthWestern. The bill’s supporters say it’s drafted in the best interest of electricity customers, and that its scope will be far more limited than opponents suggest. The aim of SB 278 is to save jobs, preserve the economic benefits of Colstrip, and provide Montana with a dependable, low-cost source of power, said the bill’s sponsor, Sen. Tom Richmond, R-Billings. The bill is currently awaiting a vote in the Senate Finance and Claims Committee. Opponents of the bill have raised concerns about its lack of constraints. 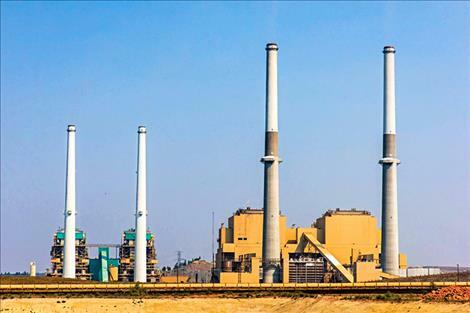 NorthWestern currently owns 220 megawatts of generating capacity in Unit 4 of the Colstrip plant, but nothing in the bill would prevent a utility from buying the entire plant and its full 2,094-megawatt production power. Late last week, however, NorthWestern firmed up negotiations with a potential seller. A spokeswoman confirmed the company plans to purchase an additional 150 megawatts in Unit 4. Ankney and Richmond said they could not disclose which of Colstrip’s joint owners is willing to offload 150 megawatts to NorthWestern, but there are only four potential sellers. Nothing in SB 278 bars the utility from purchasing additional generation in the future, however. When a utility generates more power than its customers need, it sells that electricity on the open market, sometimes at a loss. “That risk and that loss fall on captive ratepayers,” said Jason Brown, an attorney with Montana Consumer Counsel. Much of the alarm raised by SB 278 stems from its lack of limitations. The bill’s first section mandates that a utility recover its investment in a coal plant and receive a return on that investment. It requires the Montana Public Service Commission to approve electricity rates that cover those costs, including any future decommissioning and environmental cleanup expenses. The bill would force the PSC to approve higher rates for up to 30 years, even if the power plant closes early. The second part of the bill allows an electric utility to buy additional ownership of a coal-fired plant in Montana for $1. It also requires the PSC to approve “full recovery” of “all costs” incurred by the acquisition of that additional ownership, including cleanup and decommissioning costs. The bill does not require the utility to sell its additional power to Montana customers. It does not specifically mention NorthWestern or Colstrip. As written, a utility would not need to purchase additional generation to get a guaranteed return on investment on shares of the power plant it already owns. It includes no deadline for when a purchase must be finalized. The bill doesn’t define how much electricity a utility must produce to receive its rolled-back regulatory perks. “There’s nothing, absolutely nothing in the bill that requires NorthWestern to operate this resource once it acquires it,” said Anne Hedges, lead lobbyist with the Montana Environmental Information Center. Hedges said the heart of the bill is its first section. The $1 purchase price and NorthWestern’s 150-megawatt deal are distractions, she said. Removal of regulatory oversight also concerns Brown with the Montana Consumer Counsel. The Montana Constitution created the Consumer Counsel office to advocate for captive customers who must buy their power from monopoly utilities such as NorthWestern. Rates for those monopoly utilities are set by the PSC. “Ratepayers’ fear should be that if the plant is retired early, there’s nothing the [PSC] can do to protect them from stranded costs and additional decommissioning or remediation costs,” Brown said. Utilities typically roll their stranded operation, maintenance, and future cleanup costs into rates over multiple decades, similar to a mortgage on a house. The PSC approves those rates for monopolies. Not all of the utility’s costs are known, however, especially when it comes to environmental remediation. “Traditionally, and normally with regulated assets, there’s always a risk that the costs you incur are not allowed in rates. That’s a bedrock principle of rate regulation,” Brown said. In 2016, for example, the PSC denied NorthWestern’s attempt to pass along costs related to a seven-month outage at Colstrip in 2013. The utility had to buy $8.2 million in power on the open market. The PSC determined the outage was preventable, and that it wasn’t fair to make customers pay for the $8.2 million via higher electricity rates. If SB 278 passes, Brown said, nothing would prevent the utility from sticking ratepayers with a similar bill in the future. The PSC’s regulations drive “efficient, prudent utility behavior,” Brown said. Richmond said he’s open to revising parts of SB 278 to help alleviate concerns about lack of limitations. “It’s fair to say that we are working on some amendments,” Richmond said. Specifically, Richmond is reconsidering language that would allow a utility to recover “all costs” incurred in the purchase of additional coal plant generation. “That probably needs to have some sideboards on it, and maybe a time period or something like that,” Richmond said. The bill could need additional constraints to avoid a veto once it reaches the governor’s desk. Richmond said he has discussed SB 278 with Gov. Steve Bullock’s office. Montana Free Press contacted Bullock’s office for comment. “Gov. Bullock is closely monitoring the proposed legislation and is aware of the concerns that have been voiced,” said spokeswoman Marissa Perry in an email. As to fears of shackling the PSC’s regulatory authority over NorthWestern’s electricity rates, Richmond said his legislation is necessary so that the utility’s 150-megawatt bargain isn’t delayed by disputes and lawsuits. Most recently, the Sierra Club and MEIC filed disputes with NorthWestern’s application to raise electric rates, which was submitted to the PSC in September 2018. NorthWestern claims an increase is warranted in order to generate reasonable financial returns for the company. The environmental groups argue that the utility underestimated the future costs of coal ash contamination. They claim the utility inflated the market value of its ownership share of Unit 4, which impacts how much money NorthWestern can recover from ratepayers each year. The coal-fired Colstrip facility has four generation units and an adjoining mine. Colstrip’s operators must retire its older units 1 and 2 by 2022 due to a legal settlement stemming from a Clean Air Act lawsuit brought by the Sierra Club and MEIC. Ankney said the town of Colstrip will be able to largely adjust to those closures as workers retire. But the uncertainty facing units 3 and 4 puts hundreds of jobs at risk. SB 278 could bring security to plant employees, Ankney said. Federal regulation on greenhouse gas emissions and environmental optics have made coal a less attractive choice for power generation. Utilities are increasingly turning to natural gas, hydropower, and renewable energy sources such as solar and wind. Oregon law requires utilities providing power in the state to phase out coal by 2030. Washington state lawmakers are currently considering similar legislation. “Those West Coast utilities — their governments, and to some extent their ratepayers and public service commissioners — all want them to be out of coal entirely,” Richmond said. Both Ankney and Richmond claim converting Colstrip to natural gas isn’t cost-effective, and that renewables aren’t a feasible choice for Montana at this point. Leia Larsen is an award-winning reporter who has covered the environment and public policy in Colorado, Utah, and now the Montana capital. She has a master’s degree in journalism from the University of Colorado Boulder. Contact her at llarsen@mtfp.org or 406-465-3386.